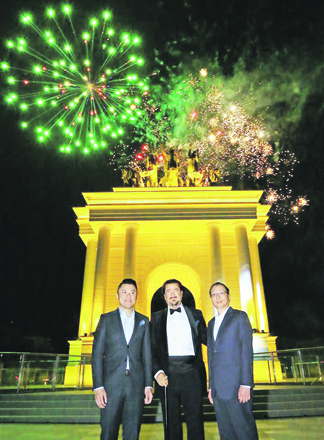 Megaworld recently unveiled a 19-meter tall monument dubbed ‘Arco de Emperador’ in Arcovia City, the property developer’s 12.3-hectare township along C-5 Road in Pasig City. The imposing structure —composed of a victorious Emperor, three horses pulling his chariot, two lions named Pride and Passion, and two trumpeting angels coated in 24K gold — was done by Spanish sculptor Gines Serran Pagan. “We created this as a tourism landmark for Metro Manila that brings out the message of how hard work, passion, and perseverance can create a self-made successful man,” explained Kevin L. Tan, EVP, and chief strategy officer, Megaworld. The arch monument will be also be highlighted by cascading waterfalls leading to the water feature at the basement area where a museum will be built. It will be surrounded by a landscaped plaza with benches. At night, the monument will be illuminated in colors, making it a vibrant centerpiece of Arcovia City as seen along C-5 Road. Arcovia City will be composed of residential towers, office towers, a lifestyle mall, open parks and gardens, and Landers Superstore. At the monument ’s unveiling were (from left to right): Tan, Serran-Pagan and William Co, president, Megaworld Resort Estates, Inc.